Octopus Tree, originally uploaded by Birdfreak.com. 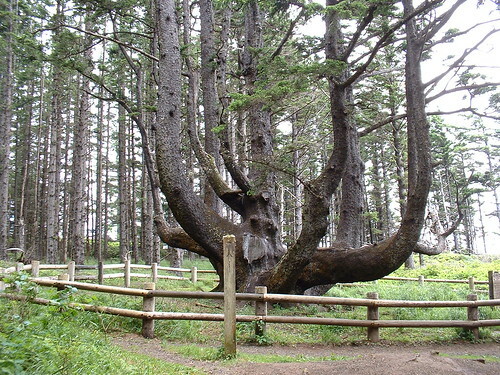 This large and unique Sitka Spruce tree is located on the Oregen Coast at Cape Meares near the Cape Meares Lighthouse State scenic viewpoint. Rather that forming a single trunk this tree has grow forming multiple trunks in a "Candelabra" fashion with each of the individual trunks being pretty much equal in size. The reason tree formed this way is probable due to the strong coastal winds that may have damaged the tree when it was young and causing its branched to grow out as trunks. "This giant old, Sitka Spruce did not develop int a masive single trunked tree as most Spruce trees do along the Oregon Coast. The candelabra branching and unusual size of this Spruce tree were formed by strong coastal winds and the sheltered hollow of its location. Each of the six candelabra limbs are at least 12 feet around and extend horizontally from the main trunk as much as 30 feet before turning upward."